I don’t know about you, but I have a whole new admiration for Emilia Clarke after her remarkable essay in The New Yorker. In this startlingly vivid essay, the 32-year-old actor revealed she had suffered not one, but two brain aneurysms while filming Game of Thrones. As many of us rewatch old episodes in preparation for season eight, it is impossible to watch Clarke’s scenes in the same way. Daenerys Targaryen has long been one of the most badass characters on the show, showing complete mastery over fire and dragons. However, the knowledge that she is portrayed by such an extraordinarily strong individual brings new dimensions to her story arc. One fan on Reddit drew attention to one particular scene, which took place during the fourth episode of season three, And Now His Watch Is Ended. 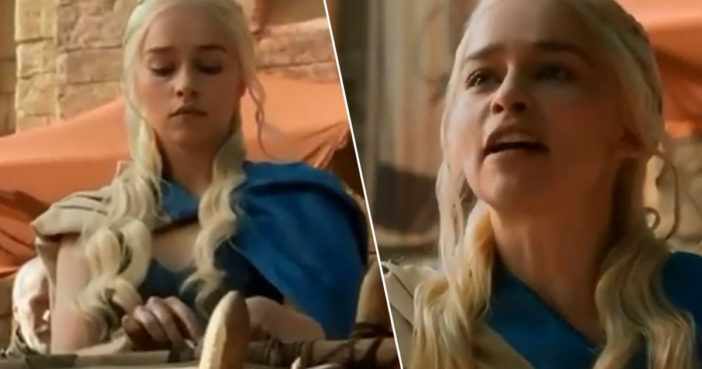 Filmed ‘in the midst of two aneurysms’, the scene takes place in Astapor and begins with Daenerys appearing to trade one of her dragons for the Unsullied army, who were previously ‘owned’ by the repulsive slaver Kraznys. However, all is not as it seems, and Daenerys proceeds to show just how much Kraznys has underestimated her. Clarke absolutely nails it, and it is flabbergasting to think she had been contending with such serious health issues at the time of filming. 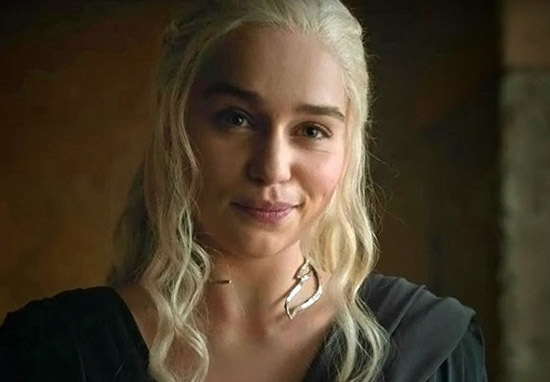 Many fans have praised the episode for being among the most memorable in the show, with Daenerys’ burgeoning queenliness depicted in all its fiery glory. The tension in this scene is unparalleled, with Clarke playing the once gentle Khaleesi with enough icy cunning to rival Cersei Lannister. For a brief moment, the audience are led to believe she had truly given up one of her beloved dragon children. But then we were reminded of her love for them, and of her potential to be a formidable ruler. This is still one of the most memorable scenes from GoT for me. After reading about Emelia Clark’s health issues I realized she is more amazing than I thought. Agreed. I still get chills watching this scene, but even moreso after reading that article and knowing what she endured. Six weeks after the surgery, the National Enquirer ran a short story. A reporter asked me about it and I denied it. But now, after keeping quiet all these years, I’m telling you the truth in full. Please believe me: I know that I am hardly unique, hardly alone. Countless people have suffered far worse, and with nothing like the care I was so lucky to receive. It’s truly commendable how Emilia Clarke has chosen to share this deeply personal and frightening experience with fans. I cannot wait to see her majestic return. [SPOILERS] Throwback because after reading that article I realized she delivered this scene in the midst of two aneurysms. Remarkable!